Steven Smith is head chef at the well-known Cinema City restaurant in Norwich. Here he explains that the secret behind sugar free chocolate desserts is to keep them simple. Q: Could you tell me a little about yourself and your work as a chef? A: "I had just returned after two and a half years in the Caribbean where I worked as head chef in a very intimate and renowned restaurant on the other side of the pond. I wanted to come home to Norwich as a head chef and begin a restaurant that used the international influences and styles and to mix that with my roots of my home city." Q: Can you tell us about the food you enjoy cooking and serving? A: "Norfolk is a community with a wealth of produce; I never understand why people choose to eat far away produce that’s travelled more miles that captain cook. Now, 16 months on from opening our doors we have continued to promote supporting local suppliers and British produce to its best. Of course I can’t take all the credit now, late last year I employed Ed and together we evolve our menu every five weeks or so to keep the seasonal produce fresh and the pizzazz and spark in our menus." Q: How easy is it to make sugar free desserts? A: "When I was asked to contribute to this article on chocolate desserts with no sugar I realised I couldn’t just reach for my recipe book, I had to look around me - and there are heaps of alternatives out there. Take over ripe bananas that have turned black for instance, they are amazingly sweet with flavour." Q: What is the key to success with a sugar free dessert? A: "Something that I have had drummed into me for many years has been to keep everything simple and not to try to re-create the wheel. That certainly goes for the desserts that are produced in the kitchen. Something as simple as a poached pear coated in sugar free chocolate and set in the fridge will have the same effect as something that you have spent hours trying to make, not to mention the stress and fiddly bits you have to deal with." Q: But can we do this at home too? A: "Well, here are two recipes that use different examples of a few of the alternatives around us everyday and can be made and served with the littlest of effort if entertaining. After all how impressive is it if you can produce fancy restaurant quality desserts and no one has seen you rushing and sweating it out in the kitchen?" Q: What are these recipes? A: "The first is a Frozen White Chocolate Parfait, with honey and rum. It is a fantastic and quick dessert that you can have done and ready the day before, using the natural sweetness of the honey and the rum. "Split the eggs. Put the yolks in one bowl and add a splash of water. Whisk over a heat till the yolks increase in size and become frothy foam. Put the white chocolate and rum in the microwave on medium heat for about 30 seconds to melt. Add the two together and whisk till smooth and well mixed together. Whisk the whites to stiff peak, then fold this into the chocolate mix. Whisk the double cream to what we call 'soft ribbon' - this is when it leaves a soft ribbon like trail behind the whisk. Fold this into the mix and then pour into pots. For this I use nice wide coffee cups, and place them in the freezer over night to set. Serve frozen, and with a saucer and tea spoon. A: "Well, this is Bitter Chocolate Coated Sauternes Poached Pear. It is a very simple dessert that uses the natural sweetness of the dessert wine to complement the pear and the bitterness of the chocolate. "Warm the dessert wine and drop in the peeled pears, simmer until slightly soft. Leave the pears in the liquid until cold and chill overnight (still in the liquid). 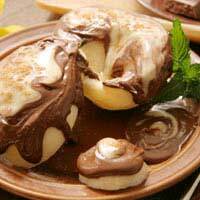 Remove the pears from the cooking liquid and melt the chocolate. Pour the chocolate over the pear to cover evenly and set in the fridge. Serve on a plate with a dollop of crème fraiche or Mascarpone. For a tip, if you have a blow torch you use for crème brulees you can give the chocolate a quick flash to make it look shiny."